It is safe to assume that in a company no department is ever created with the sole purpose of antagonizing another. Interdepartmental conflicts, if left unresolved and uncontrolled, may result in disastrous consequences for businesses, and managers and senior executives are always on the lookout for such untoward situations within their companies. In most cases, interdepartmental conflicts arise from differences in backgrounds, experiences, expertise and, even, personalities of the members that compose the teams. But, in some instances, these encounters stem from structural differences in the departments’ organizational objectives. Let us take a close look at two departments that frequently lock horns over various issues: Marketing and Information Technology (IT). IT’s performance lies in maintaining the stability, reliability and security of a company’s technological infrastructure, including management information systems, digital technology, CRM, ERP, hardware and the internet of things. In order to fulfill this, an IT department should ensure the standardization and the strategic management of a firm’s technological infrastructure. If you are a fan of the Game of Thrones, you can easily see the Arryns in them: Their job is to oversee the wellness of the realm, and to remain on their toes for any incoming issue. On the other, Marketing’s priorities rest on acquiring more customers and introducing new ideas and innovations on an everyday basis, if possible. It is a department that is always on the chase for the “next big thing”, which can, to some extent, be a strategy that is observed to be unstable and unsecure. Marketers are the Starks: They like to move from one place to another in the interest of networking and building relationships. Like the Starks, they are always in search of new connections from which they gain a competitive advantage of their adversaries. How To Avoid The Clash? Faced with a daunting task of reconciling priorities that appear to rest on opposite ends of the spectrum, what should a company executive or a director do to eliminate the interdepartmental conflict between Marketing and IT? Well, it is important to note that the aim should not be to “eliminate” the rivalry but to “balance” it. 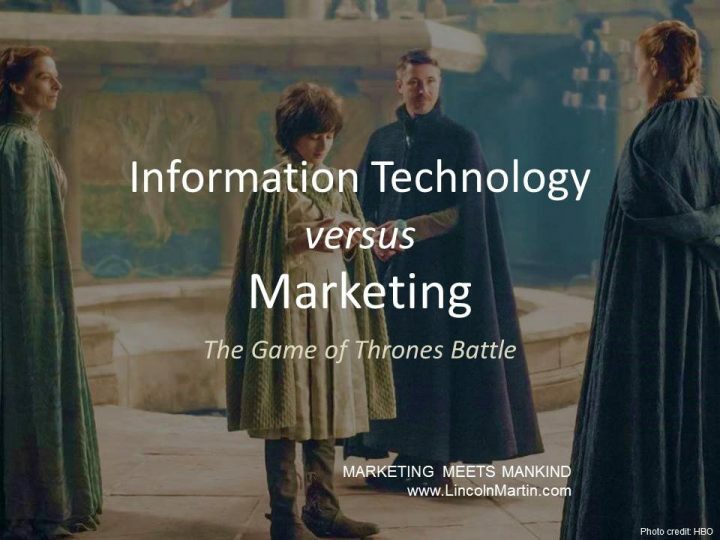 To a certain degree, Marketing and IT should conflict, because a company needs both the stability-mentality of an IT department and the innovative experimentation of Marketing. Company leaders should learn where to “put the weight” to balance the two departments’ competing objectives. The directors should be able to open the doors to compromise and, eventually, integration. With the advent of growth hacking, online marketing, digital communications, internet advertising, e-commerce, and other technology driven communications, it is also relevant to note that appointing a Chief Marketing Technologist may help this cause. It is important to have a senior employee that oversees the execution of marketing agendas, but with respect for the stability, security and long-term viability of a company’s technological architecture, with special emphasis on growing the company’s bottom line. In a nutshell, this person should ensure that aggressive growth ideas are not reckless, but measureable (metrics), profitable (scale) and manageable (sustainability).